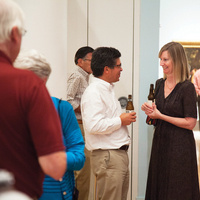 Gather with friends after hours at Reynolda for music, art-making, a cash bar, and light refreshments. Bring your favorite person for a date night at Reynolda! Explore the works of American modernist artists in the gallery, try your hand at creating your own abstract masterpiece, and listen to the jazzy sounds of Duke Ellington and his contemporaries performed by Winston-Salem’s Jazz Classique. Top off the evening at one of Reynolda Village’s fabulous restaurants.